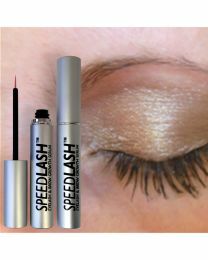 SPEEDLASH™ is based on a European formula discovered and developed in France 2 years ago. Containing natural ingredients that promote eyelash and eyebrow hair growth by re-activating dormant hair follicles strengthening and lengthening existing ones . This formula became available to several manufacturers. 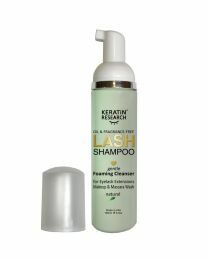 At Keratin Research we are not claiming to be the ones who discovered it and crediting ourselves for such a wonderful product like SPEEDLASH™ , however we are able to offer you great proven products for reasonable price and guarantee it. SPEEDLASH™ have been independently tested and proven to work. Q. When will I see results with Speedlash Eyelash™ growth serum? 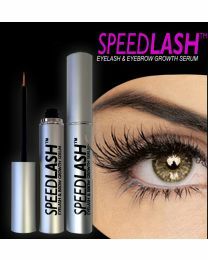 A. Speedlash™ Eyelash growth serum growth results appear in about 2-3 weeks. Q. What shall I expect to see? A. At first your eyelashes will get fuller as the roots are getting healthier, you will notice more lashes growing (the ones you lost) and they are getting condensed and darker at first and only at later stages you will notice longer eyelashes. Q. Can I use Speedlash™ Eyelash growth serum if I wear contact lenses? A. Yes. Speedlash™ Eyelash growth serum is non-irritant and will not affect contact lenses. Q. Can I use Speedlash™ Eyelash growth serum? A. Yes, Speedlash™ Eyelash growth serum is safe for individuals with sensitive eyes. Q. Do I need to keep using eyelash growth products to maintain results? A. that is individual to each person, however once or twice a week will always make sure the rate of your eyelash growth is maintained. Q. Does Speedlash™ contain the same ingredients as Latisse? A. No, Latisse contains drugs and is by prescription only. Q. Is Speedlash FDA approved? A. No it does not need FDA approval it does not contain drugs. Q. Can I use Speedlash on my Eyebrows? A. Yes you can it also known to effectively grow your brows. Q. What if it gets in my eye? A. Simply rinse it with water. Q. What if it discomfort and sting my eyes? A. You will need to stop using it, however during Speedlash™ testing such incidents did not occur and in few cases it did sting for a second or two. Q. Can I use Speedlash™ if I am pregnant or breast feeding?